A report shows 41% of pregnancies in New York City end in abortion. Obviously, pro-life groups are freaking out — but the news shouldn't necessarily be that surprising. According to the NY Post, the New York City Health Department reported 87,273 abortions in New York last year, comprising about 41% of all pregnancies. The Post says the national rate is more like 19%. In response to these numbers, religious leaders gathered yesterday to make helpful recommendations like stopping condom distribution — because restricting access to birth control is obviously the best way to reduce unplanned pregnancy. In all seriousness, though, it's not a surprise that New York City's abortion rate is higher than the national average. For one thing, women actually have access to abortion there. As of 2005, NYC had 34 abortion clinics — the state of North Dakota had one. And while there are anti-choicers everywhere, their influence in New York is counterbalanced by a large pro-choice community. 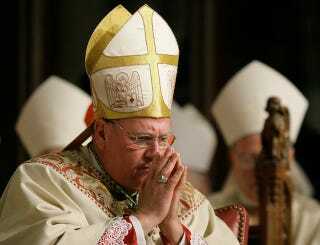 Even New York's Archbishop Timothy Dolan (pictured) broke with official Church doctrine to some degree by saying, "I invite all to come together to make abortion rare." Now if he's willing to admit that reducing abortions means reducing unplanned pregnancies, which requires improved access to birth control, we might have some ground to come together on.